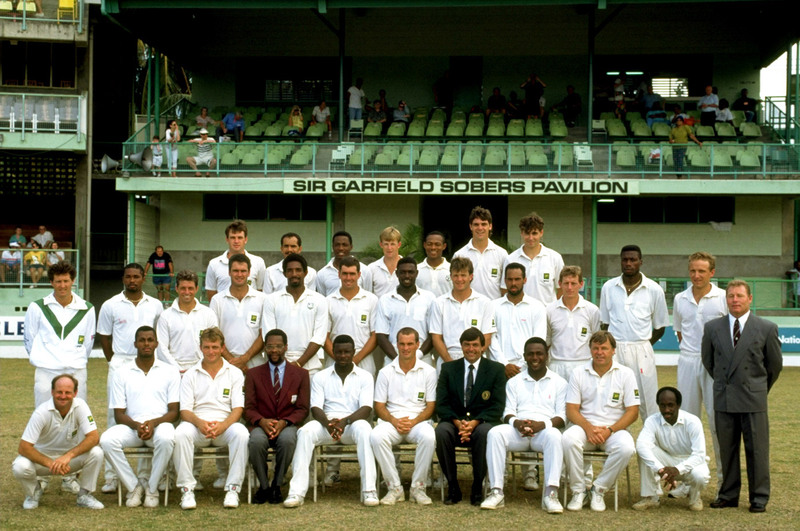 Part homecoming, part reckless adventure, South Africa's first readmission Test took place in April 1992, in the slightly incongruous surrounds of the Kensington Oval, Barbados. It was a tour that almost didn't happen. Ali Bacher, the United Cricket Board chief executive, noticed that Deryck Murray of the West Indies cricket board had abstained from voting for the South Africans to sneak into the 1992 World Cup, citing lack of unanimity from his board. Bacher and his lieutenants, minister of sport elect Steve Tshwete, and new United Cricket Board president Geoff Dakin, had schmoozed their way into many a heart since South Africa toured India at the end of the previous year but the West Indians remained enigmatic, even distant. Sensing that something might be amiss, Bacher invited Clyde Walcott and Steve Camacho of the WICB for a visit. Bacher knew the West Indians' next scheduled home series was against Pakistan in 1993, so there was no rush to conclude anything. Then again, South Africa were suddenly the darlings of the world - and the novelty wouldn't last forever. As Walcott and Camacho sat across from him, he pulled out his desk calendar and suggested something in the Caribbean soon. The haggling began. Eventually it was decided for three ODIs spread between Jamaica and Trinidad and Tobago with a one-off Test in Barbados. The parties retired to sell the idea to their constituencies. Michael Manley, Jamaica's prime minister, wouldn't budge. He argued that South Africa's first democratic government was some way off and that the tour was therefore premature. It finally needed a letter from Nelson Mandela to move him - and move him it did. But the South Africans themselves were reluctant tourists, some deeply so. Bacher found Kepler Wessels, his captain, less than convinced. "Our chaps weren't too keen - they had some reservations," he said. "Kepler felt we were rushing things." Wessels' worst fears were confirmed in the first ODI in early April. Before a packed Sabina Park crowd, Phil Simmons smashed five sixes in a rollicking 122, one of them a back-foot drive off Corrie van Zyl that sailed clear over the grandstand roof. With 50 from Brian Lara and the generosity of 22 extras, West Indies gunned their way to 287. The visitors - shell-shocked and insecure - lost by 107 runs. Their World Cup fairy tale now a rapidly fading dream, South Africa hopped to Trinidad with a mounting concern. The two run-outs in Jamaica became three in the second ODI, as the South Africans crawled their way to 152 to lose by ten wickets. There were glimmers of the hope in the third match, but another Simmons ton meant West Indies romped home by seven wickets. All of Wessels' latent fears were confirmed. He and the senior players had been on the road since touring India in November and it was the end of a protracted, emotionally exhausting summer. Many would have preferred to have spent Easter at home with their families. The Caribbean tour smacked of a public-relations fandango, they muttered. And they still had a Test to play, a match in which South Africa would carry ten debutants and a crate-load of trepidation. Still, you could touch the excitement. Richard Snell, one of those ten debutants, remembers the buzz of the police cavalcade and the honour of rubbing shoulders with smart, lippy fans. Everyone, ranging from folk on the streets, to taxi drivers and hotel waiters bearing rum punches, had colourful, frequently expressed views. 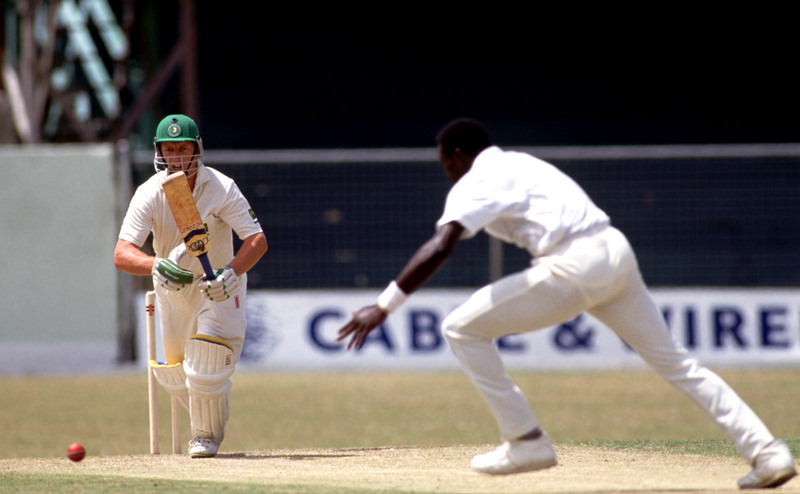 The South Africans brought a television crew from the national broadcaster to Barbados, and former players like Jackie McGlew and Tiger Lance flew in on junkets. As far as strategy was concerned, there was a pragmatic attempt to consign the three ODIs to memory, cut out the experiment with left-arm spinner Omar Henry, and play four quicks. South Africa felt cornered. "I was the bane of the physiotherapy department's [at Wits University in Johannesburg] life in situations like these, because I was always [going away to play cricket] missing exams and deferring. It was such a busy summer that I don't think I did the previous year's end-of-year exams. I took seven years to get my degree," remembers Snell. In the run-up to the Test the South Africans were also buoyed by grass-roots support for a stay-away. Anderson Cummins, the Bajan fast bowler who had had a good one-day series, was left out of the Test side and the locals were peeved. They'd listen in on their radios instead, they grumped. This feisty expression of the popular will was captured with wry humour by veteran writer and commentator Tony Cozier. "Their resolve is likely to be tested if they hear Desmond Haynes in not out on 90 and closing in on his century," he chuckled. Alan Jordaan, the tour manager, remembers lengthy discussions about the toss. There was a little grass on the track and the South Africans were petrified that nerves would overcome them if they batted first. "If things went wrong we could be bowled out for 50," he recalls, adding that over the course of several days, the pendulum swung to bowling if Wessels called correctly. "The guys felt that if you bowled three wides, you could be nursed to the end of the over and be replaced. 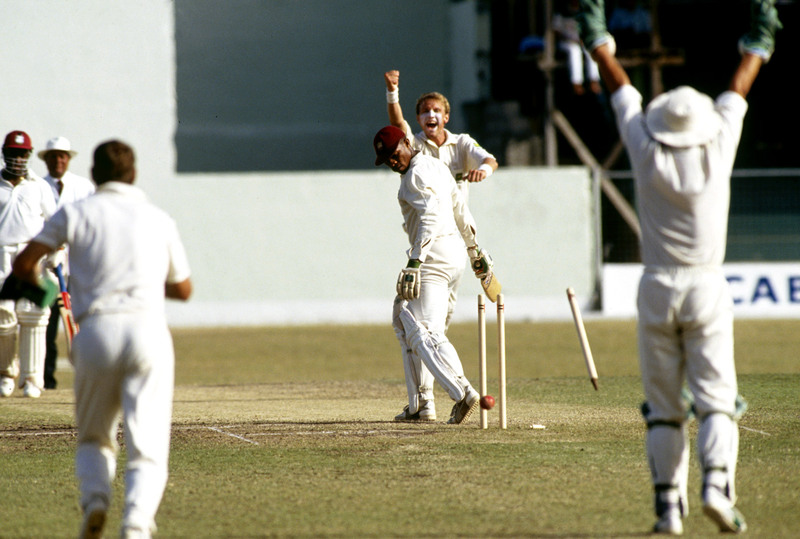 Don't forget, this was our first Test for 22 years, and looking back, it was a one-day team playing Test cricket. The side, as it was, would never have been picked today. We were without Brian McMillan, who was injured, and we were green as all hell." Snell wasn't quite as overwhelmed. He'd grown up in a hard domestic school, with players like Clive Rice and Wessels on hand to shepherd the youngsters along. He knew the South Africans lacked for experience, but when West Indies batted (Wessels won the toss), he was heartened by the Dukes ball taking swing. There was swinging at the other end too, as Simmons and Haynes flayed Allan Donald, Tertius Bosch and Meyrick Pringle for all they were worth. Snell came on second change, and suddenly, with the total on 99 in 22 overs, Simmons (35) bunted a Snell delivery to Peter Kirsten at mid-off. Despite the arrival of the left-handed Brian Lara, Snell continued to bowl over the wicket, and Lara nicked off. "It was an easy catch to Kepler in the slips and he dropped it - Lara was still on nought." Did he show his disappointment? "No, no, no, that's part of the game, that's what makes it such a good leveller - that's why everyone should play cricket." Wessels made amends, catching Haynes off Snell for 58, and with Bosch accounting for Lara (17), the visitors had a sniff. The door was quickly closed. Richie Richardson and Keith Arthurton breezed along at a run a ball. Then Snell had Richardson feathering a chance behind to his namesake, Dave, for 44. "The problem with me is that I always played with niggles - usually shin splints," said Snell. "If you've got a smooth, easy action, you can get away with it, but mine definitely wasn't anything like that. Donald had a beautiful action. It gives you real longevity. You can play at about 80% and still be efficient. I remember facing Allan domestically off 15 paces and he bowled a 15-over spell without losing anything. It was incredible." Donald wheedled out Jimmy Adams, and David Williams, and with Pringle accounting for Arthurton, suddenly the West Indies innings was spent. Wessels and the grim men couldn't believe their luck. West Indies were all out for 262, Snell had taken 4 for 83. After losing Mark Rushmere, Andrew Hudson, the upright Natal opener, was joined by his captain. Somewhere along the line Wessels had got it into his head that there was no use employing crabby defence against Curtly Ambrose, Patrick Patterson and Courtney Walsh. "If you asked me, in my own heart, I always thought Kepler would grind it out," remembers Jordaan. "It wasn't that way at all. He hit a few booming drives that spiralled over point and he just went for it. He knew that you can't defend forever, so if it was in his hitting zone he had a full go." The two put on a second-wicket stand of 125. Wessels fell after lunch, cutting to Jimmy Adams at backward point for 59. His last innings back in South Africa had been a match-winning century for Eastern Province in the Benson and Hedges final against Western Province at the Wanderers on April Fool's Day. Reflecting on the Wanderers knock in the dressing room, he said: "After this, everything back there was in slow motion." Hudson lost Peter Kirsten and Hansie Cronje in quick succession but he was finding his range, his innings a medley of straight drives and crisp pulls. Adrian Kuiper played a counter-intuitive innings of great care at the other end. Hudson went to 99 with a four off Kenny Benjamin and reached his hundred with a single off Adams. The pair was not out overnight, resuming on the third morning to fashion a fifth-wicket stand of 92. After Kuiper departed for an obdurate 34 (168 balls in over three hours), 279 for 5 spluttered to 345 all out. Hudson scored 163 and, in part, put the innings down to the masterclass he received while opening with Henry Fotheringham at Natal. "I learnt more batting with Henry in one season as a rookie than I had in my entire career up until that point," said Hudson. "He taught me about handling pressure and about projecting myself at the bowlers." Snell found that the cherry was still swinging and accounted for Haynes and Richardson cheaply in West Indies' second dig. Lara eased his way to a polished 64, but with wickets falling, it was left to Adams to give the innings much-needed respectability. He ground out 79 and West Indies folded for 283. "We'd beaten them in Christchurch in the World Cup," said Jordaan. "So we knew we were in with a chance. Some of that advantage was lost during the one-dayers, but we'd done it before so we knew it wasn't impossible." Despite the early loss of Hudson and Rushmere, Wessels and Kirsten consolidated in pursuit of the 201 needed for victory. At close on the fourth day, South Africa were 122 for 2, with Wessels on 74 and Kirsten on 36. The rumour mill has subsequently made much of the South Africans' late-night carousing as they celebrated an inevitable victory the following day, but Jordaan says these stories were exaggerated. Wessels' policy was always one of treating the players like adults - with the caveat that should the boozing affect their performances, they were in for trouble. Jordaan remembers the perky McGlew counting his chickens, though. "I'll never forget him coming up to me and saying: 'Jordie, this one's in the bag, well done, great victory.' I didn't know what had got into him, because Jackie was never like that. He'd played enough to realise that it's never over until you're home and dry." Wessels didn't add to his overnight score. He was brilliantly caught low by Lara in the slips, and after that it was a procession. Snell remembers that the wicket had gone rogue. "There was no way to make runs," he said. "Some were flying past your shoulder, some were scuttling, it was impossible." He also says that stories of South African celebrations were overplayed. The South Africans, desperate for a win on the tour the players never really wanted, realised that they wouldn't come this way again but were powerless to bend the match in their direction. Ambrose scythed through them with 6 for 34; Walsh picked up 4 for 31. West Indies won by 52 runs. Hastily arranged, at times politically fraught, it was a match like no other. It would take nearly seven years for West Indies to visit South Africa. By that time the two teams and world cricket had changed completely. South Africa need 79 to win but can they get past Wambrose?